Time is up - burn the world"
This is a fantastic album. It's black metal and - it's not. Hard to define, but that's ok because Satyricon is apparently in the midst of redefining the black metal genre. It's rock, it's heavy, it's melodic - but it is still VERY black. Originally I was not a big fan of black metal (you may wan't to skip this part, if you're not into tiresome anecdotes) it was just a bunch of silly noise wrapped in poor productions in MY ears (and that's saying a lot, coming from someone who likes grindcore). I was introduced to black metal á plenty, but nothing really stuck to me. Untill one night when my old band, Frozen Sun, played a warm-up gig for swedish Dissection in Ålborg. You may say I saw the light (or more appropriate the "blackness"). Having performed a great gig ourselves, it was time to see what the headliners were all about. And everything was dark - no lights on stage, no lights in the audience - the sound engineer at the back was suddenly very present in the glow of the many dials, knobs and meters. And then the band started. Two bright white projectors mounted in front of the drums, pointed up at the bottom side of each of the drummer's crash cymbals. And every time he hit one of those cymbals, a golden beam would pierce the hall and randomly illuminate faces in the crowd. And there was no other light, appart from various candles at tables in the hall. I was in awe. And the band performed with an energy I had not seen in a long time. They meant business. - from that day on, I LOVED black metal - not all black metal, but a lot of it. And despite all the controversy about murders and radical beliefs among certain members of various black metal bands, there's no denying that the music has a lot of energy. But enough about Dissection, and my first "real" black metal experience (you may start reading again now, if you decided to skip the anecdote). 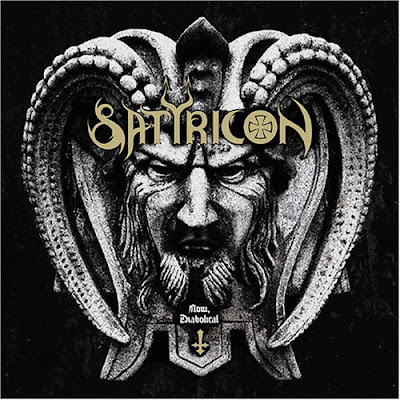 As mentioned Satyricon is redefining the genre, and bringing a lot of new influences into their music. Now I don't think I know all Satyricon albums - but I do know the 3 most recent, as well as the classic "Nemesis Divina" - and there's miles apart from the recent three to Nemesis. I started noticing the change on Rebel Extravaganza which was much more experimental than I would expect from a black metal band - nothing like the straight and brutal Nemesis, which is much more typical black metal. And I liked it. And over the next two albums (Volcano and Now, diabolical) I wen't from liking to loving it. The new crossover that has evolved is definetely something else. Far from the melodic and almost over-produced passages you get on more recent Dimmu Borgir or Emperor albums, yet still strangely familiar. I don't think there's a bad song on the entire album, although my favourite has to be "The pentagram burns". It's just good from start to finish - and the songs have been carefully arranged in the perfect order, finalizing this masterpiece with the extremely dark and aethereal "To the mountains". If I have to point my finger at something, it would be that the production could easily have been a little better, without compromising the black.